Yesterday we brought you the first of two posts on the h-index. Since many of the questions the Scopus team receives from users are related to the h-index and how it is calculated, we thought it was a worthy topic for two posts. Today's post, Part II, is focused on a specific author and his/her h-index. Thanks again to our guest author Meshna Koren, Second Line Support Manager for Scopus (also known as "she who knows all about Scopus"). Obviously, nobody cares about an h-index for articles about water and ice on Mars; people want to be able to evaluate another author's work! So they'd run a search more like this instead: AU-ID(26643014200) or AU-ID("Baker, Victor R." 26643014200) which would return all articles that were written by Mr. Baker. We get the results, we calculate Citation Overview and we look at the great h-index of 40. This is a high value for one author. Many of the questions we receive are related to the h-index. Today we bring you a guest post by Meshna Koren, Second Line Support Manager for Scopus (also known as "she who knows all about Scopus"). A scientist has an index h if h of his/her Np papers has at least h citations each, and the other (Np h) papers have no more than h citations each. In Scopus you can calculate it on any set of results; it does not have to be papers belonging to just one author. 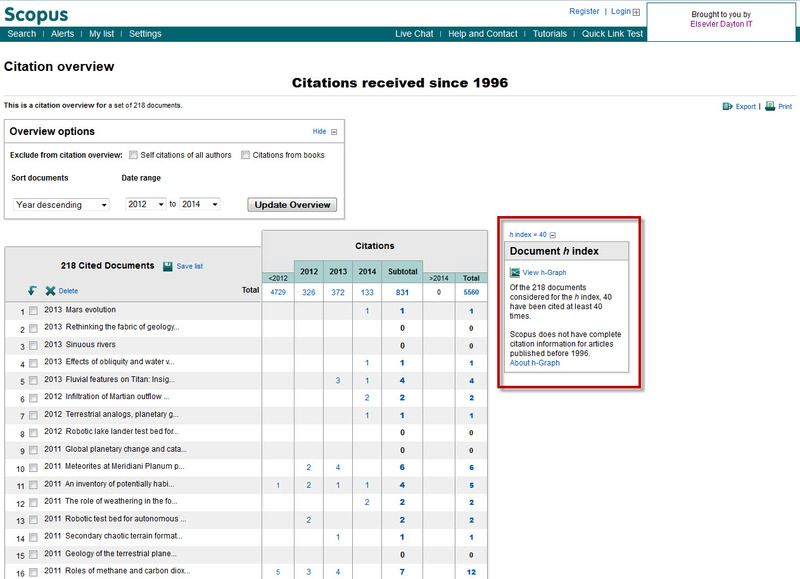 Just run a random search: TITLE-ABS-KEY(mars water ice), select all results, click View Citation Overview and therein you will see the h-index value for that set (see image). If anyone in our Amsterdam office sits near the Scopus team they may have overheard us tossing out numbers such as “1970”, “8 million” and “1996”. What do these numbers have in common exactly? They are all integral to the Scopus Cited References Expansion program which launched earlier this month and will (begin to) become evident with the Scopus interface in the fourth quarter of 2014. 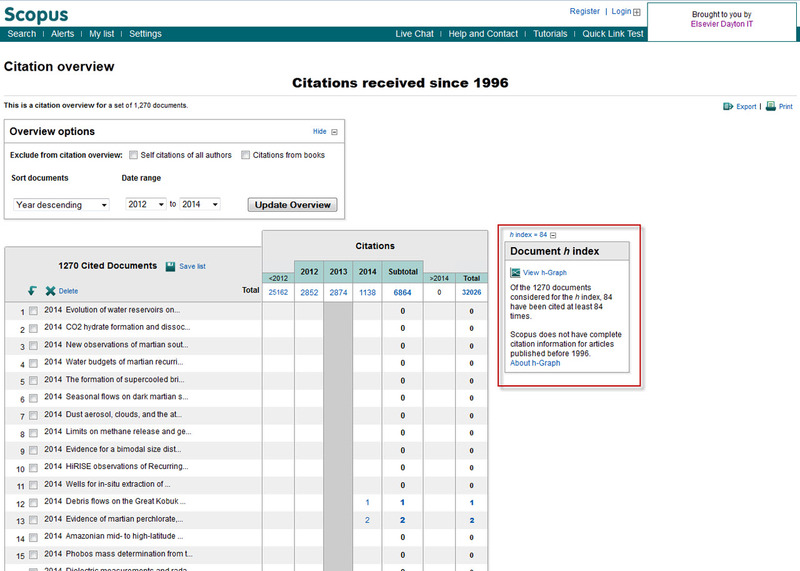 The Scopus team is thrilled to officially announce the launch of the Scopus Cited References Expansion project. After extensive evaluation of feedback from the research community, internal discussion and operational documentation, our content team successfully made the investment case to include cited references in the Scopus database – going back to 1970 for pre-1996 content! Although the official notice went out in November, we thought this further integration with Ex Libris Primo was worthy of its own blog post. Scopus and Ex Libris®Group, a leader in the provision of library technology solutions, announced on November 18 a collaborative initiative to use the source-normalized impact per paper (SNIP) and SCImago Journal Rank (SJR) metrics included in Scopus. Primo plans to use these article/journal metrics to calculate the relevance ranking for the Primo discovery service search results. So what’s so great about SNIP and SJR? For SNIP, an important distinction is that it takes into account the fact that the frequency of citations varies from one field to another thus normalizing for field so that comparisons can be made. The SJR indicator combines several factors to produce a measure of the prestige of the citing source (some like to compare this to the way Google ranks pages).